The very best of northern Scotland lies ahead on this international adventure, which uses the water-side city of Inverness as homebase for spectacular mainline and steam railway adventures around the island. The varied landscape of northern Scotland and astounding history of the region draws tourists from all around the world each year; however, those that choose to explore the country using this 6-day tour are in for a treat. Based out of Inverness, this tour begins with free time to get acquainted with the country. Soak in the pub culture, see the sites or enjoy the contrast of the storied city against the lovely waters of the River Ness. It is on the third day that the adventure begins, as travelers make their way along famed rail lines such as the Jacobite Steam Train, the West Highland Line, the Kyle Line, the Highland Railroad, the Strathspey Steam Railroad and the Cairngorm Mountain Railroad. While the railways and trains themselves are incredible, it is the stops and views along the way that make this journey magnificent. 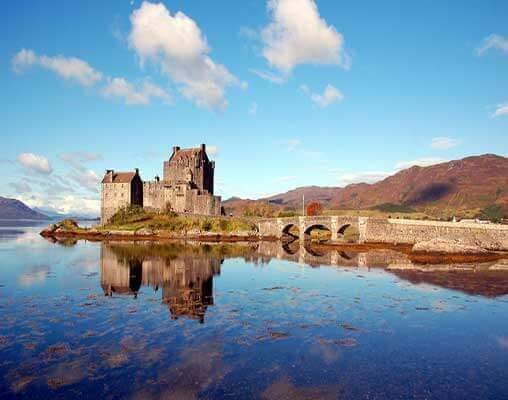 Enjoy things such as crossing the 21 arches of the Glenfinnan Viaduct (famed for its feature in the Harry Potter films), a tour of the Eilean Donan Castle and a journey through Cairngorm National Park, amongst other stops and excursions. With so much to do and see during this brief journey, travelers have a true chance to immerse themselves in the wonder that is Scotland. Our tour begins in Inverness at the Palace Hotel & Spa, which overlooks the River Ness in the center of the city. Perhaps familiarise yourself with the city on a riverside stroll before meeting for this evening's meal. This delightful city is considered to be the capital of the Highlands, and it is crowned by the stunning Inverness Castle. *The Jacobite Steam Train does not operate until mid- May. Earlier departures are booked onto Scotrail. Our excursion today is on the tracks of the historic Highland Railroad. Traveling to Aviemore by rail, we join the nostalgic Strathspey Steam Railroad. From Aviemore through to Broomhill, the train passes moorlands, woods and by the River Spey. Through the large windows of the excellently restored carriages, take in the stunning sights of the Cairngorm National Park. From rolling hills blanketed by purple heather, to the craggy top of Cairngorm Mountain, to mysterious depths of the thick pine forests, pass through some of the most delightful stations in Scotland on this short but rather spectacular journey. The final station on the line, Broomhill, could also be recognisable thanks to its use in the television series 'Monarch of the Glen', where it is used as the station for 'Glenbogle'. There is even a 'Glenbogle' sign that still stands at the station, and there is plenty of time to stretch your legs and breathe in the fresh, Scottish air on arrival. 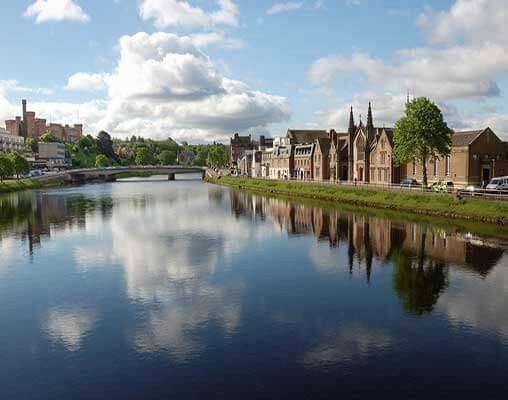 The welcoming 3-Star Best Western Inverness Palace Hotel & Spa on the banks of the River Ness is a short walk away from the city centre and the perfect place to relax and watch the river flow by. Built over 100 years ago, the hotel is equipped with a swimming pool, leisure club, brasserie and lounge. Rooms include hairdryer and television. The Cairngorm Mountain Railroad is just over a mile in length, running from the base to the summit of Cairn Gorm, the peak that gives its name to the entire mountain range and even the surrounding National Park. The wonderful journey on the Jacobite Steam Train takes us along a section of the West Highland Line, which stretches from Glasgow to Mallaig, and takes passengers through some of the most breathtaking mountain scenery in the UK. We begin in the town of Fort William, spectacularly situated with Ben Nevis as its backdrop. As we leave Fort William we travel along the shores of Loch Linnhe before tackling the increasingly demanding Highland terrain. At Glenfinnan we reach the most scenic and dramatic section of the line, as the train crosses the 21 arches of the Glenfinnan Viaduct: a magnificent feat of railroad engineering. Leaving Glenfinnan, the landscape opens up and we catch our first glimpse of the sea and the small islands close to the shore. During this section of the journey, the Jacobite Steam Train travels across two more viaducts: Gleann Mama and the Borrowdale Viaduct before reaching the small towns of Morar and Arisaig. On a clear, sunny day, the white sandy beaches along this stretch of coastline provide a beautiful contrast with the blue waters of the sea. From here, it is only short distance to our final destination, the busy fishing town of Mallaig. The Kyle Line takes us on one of the most scenic rail journeys in the British Isles, traveling between Inverness and Kyle of Lochalsh. On leaving Inverness, the line hugs the shores of the Beauly Firth before heading north to Dingwall. From here, the line immediately turns inland and climbs over the Highlands. As a result of a dispute with the landowners of the time, the builders of the railroad were forced to make a sharp detour around Strathpeffer. After a steep climb to Black Rock the line descends through beautiful wooded hillsides until it reaches Garve on the shore of Loch Garve. On a still clear day this loch perfectly mirrors the surrounding hills and trees. From Garve station the line climbs up to the broad straths leading to the West Coast before climbing to the summit of the line at Luib. The line then descends to the magnificent scenery of Loch Carron, where it twists and turns in and out of the loch side inlets. Plockton station and village, with yachts anchored in the shelter of its beautiful bay, is the next passing point, and was the location for the BBC Television series 'Hamish Macbeth'. The final section of the journey is perhaps the most dramatic (and the most expensive), as it was carved through the solid rock that leads to Kyle Pier. Kyle of Lochalsh ("strait of the foaming lake") sits at the entrance to Loch Alsh, opposite Kyleakin on the Isle of Skye. The two villages were formerly connected by a ferry service, but this was replaced by the Skye Bridge in 1995. We use the Scotrail service, traveling in Standard Class, on early tours that use the West Highland Line in Scotland. Scotrail is operated by Abellio, and links the main cities in Scotland, taking us through some of the most stunning scenery in the world. On these trains, we see some of the most famous sights in Scotland, including Loch Lomond. 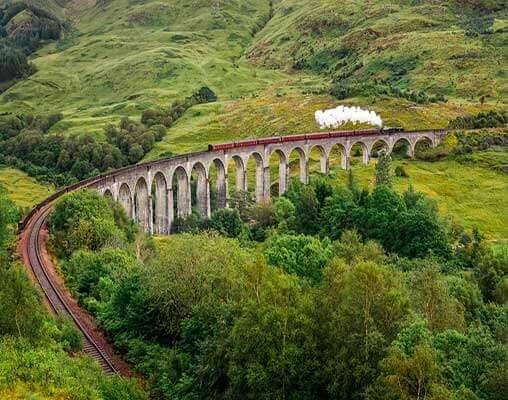 For customers taking the service to Fort William and Mallaig, we will travel over the spectacular Glenfinnan Viaduct, an incredible feat of railroad engineering that has been most famously featured in the 'Harry Potter' films. Other customers may be going west, to Oban, where you will pass the Falls of Lora and the atmospheric Kilchurn Castle on your journey. We enjoy an impressive journey on the Strathspey Steam Railroad, taking a 20-mile round trip through Scotland's magnificent Highland scenery. The former mainline route begins at Aviemore railroad station, which also hosts modern trains on the National Rail network. Leaving the station yard, the train navigates a level crossing and continues against the breathtaking backdrop of the Cairngorms National Park. With the gushing River Spey running alongside the line, the heritage locomotive continues under the shadow of high mountains and dense sloping woodland to the station at Boat of Garten. This immaculately preserved station features its full range of original buildings dating back to 1904, making it popular with rail enthusiasts. On leaving the station, the next leg of our journey takes us through some beautiful landscapes, including the charming rural farmland scenery straddling the meandering River Spey. In summer, there are many vivid colors in the fields; a multitude of greens and even the purples of heather and gorse lining the trackside. After climbing through the valley, we arrive at Broomhill station - the line's current terminus and a double for 'Glenbogle' station in the TV series 'Monarch of the Glen'. Click here to view testimonials for Highland Adventure. The trip manager was exceptionally organized and so personable. Also our reservation specialist was extremely helpful as she's been on a previous trip. The itinerary was superb! Enter your details below if you would like to be notified when 2020 dates and prices are available for Highland Adventure. Prices are land-only, per person based on double occupancy. Prices are correct at the time of this web page going live; however are subject to confirmation at time of booking.